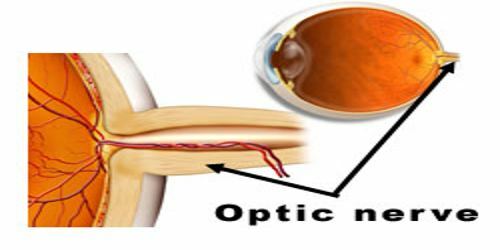 Optic nerve is either of the second pair of cranial nerves, which carry sensory information relating to vision from the retina of the eye to the brain. Disease or injury of the optic nerve can result in partial or total blindness. The optic nerve carries the impulses formed by the retina, the nerve layer that lines the back of the eye and senses light and creates impulses. These impulses are dispatched through the optic nerve to the brain, which interprets them as images. Using an ophthalmoscope, the head of the optic nerve can be easily seen. It can be viewed as the only visible part of the brain (or extension of it). It is derived from optic stalks during the seventh week of development and is composed of retinal ganglion cell axons and glial cells. In humans, the optic nerve extends from the optic disc to the optic chiasma and continues as the optic tract to the lateral geniculate nucleus, pretectal nuclei, and superior colliculus. It is also called the second cranial nerve or cranial nerve II. It is the second of several pairs of cranial nerves. The job of the optic nerve is to transfer visual information from the retina to the vision centers of the brain via electrical impulses. The optic nerve is made of ganglionic cells or nerve cells. It consists of over one million nerve fibers. Our blind spot is caused by the absence of specialized photosensitive (light-sensitive) cells, or photoreceptors, in the part of the retina where the optic nerve exits the eye. 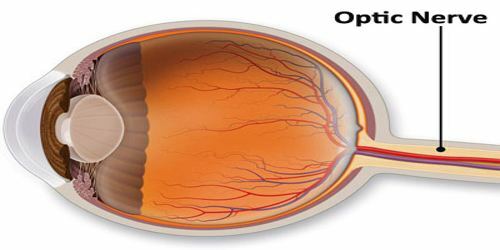 The word “optic” comes from the Greek “optikos”, pertaining to sight. 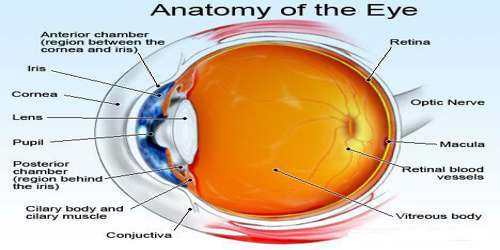 Aside from the optic nerve, the eye has a number of other components. These include the cornea, iris, pupil, lens, retina, macula, and vitreous. The cornea is the clear front window of the eye that transmits and focuses light into the eye. The iris is the colored part of the eye that helps regulate the amount of light that enters the eye. The pupil is the dark aperture in the iris that determines how much light is let into the eye. The lens is the transparent structure inside the eye that focuses light rays onto the retina. The retina is, as mentioned, the nerve layer that lines the back of the eye, senses light and creates impulses that go through the optic nerve to the brain. The macula is a small area in the retina that contains special light-sensitive cells and allows us to see fine details clearly. The vitreous humor is a clear, jelly-like substance that fills the middle of the eye. Glaucoma is one of the most common illnesses affecting the optic nerve. Glaucoma is caused by high intraocular pressure, or high pressure in the fluid that is inside the eye (vitreous fluid). This high pressure compresses the optic nerve and causes cells to die. It is referred to as atrophy of the optic nerve. Although the optic nerve is part of the eye, it is considered part of the central nervous system. The optic nerve takes visual information gathered from our eye and transmits it using a series of electrical impulses to the parts of our brain that act as vision centers, allowing us to make sense of what we are seeing. Each optic nerve is a bundle of more than one million nerve cell fibers (specifically, Ganglionic cells) that work together to help us see.